The A521 Uttoxeter Road in Blythe Bridge, near Stoke-on-Trent, will be closed both sides of the level crossing from Sunday 8th April 2018 for approximately a week while emergency gas works take place. Engineers will be tracing and repairing a gas leak near the level crossing. A diversion route will be in place via the B5029 Grindley Lane, A50 Uttoxeter Road, A521 Uttoxeter Road. If by 23 October, 2017 (14 days excluding Dies Non, after the date of this notice) a request for an election to fill said vacancy is made in writing to the Returning Officer at the address below by TEN electors for the said Parish, an election will be held to fill the said vacancy, otherwise the vacancy will be filled by co-option. If an election is called, it will take place not later than 27 December, 2017. Leek Town Community Sports Football Coaches will be holding free football sessions for young people aged between 8 & 18. 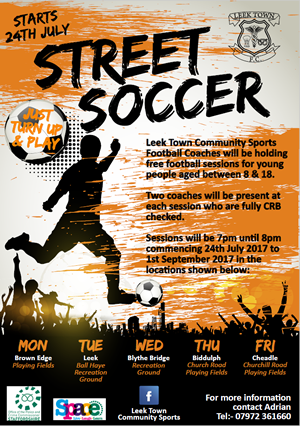 Two coaches will be present at each session who are fully CRB checked. Please find below links to the details of the latest Temporary Traffic Regulation Order for your information for Stallington Road, Blythe Bridge. Notice of Annual Parish meeting for ALL Forsbrook Parish Electors. Attracting young children to tennis is of high priority for, coaching firm, SMASH Tennis UK. The team of Craig Leese and Jack Redfern are mid-way through a free six-week coaching programme launched by the Lawn Tennis Association (LTA) aptly named, Tennis for Kids. 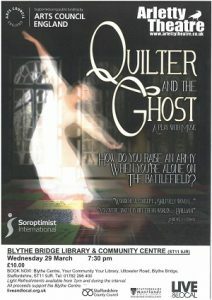 Award-winning Arletty Theatre returns with Quilter and the Ghost, after the wonderful responses to their Arts Council funded musical play, Swan Canaries (Best Theatre Production, Buxton Fringe 2014). Please read the letter below which has been sent to parents regarding the forthcoming work. I am happy to speak to any of the residents to ensure that the parish are not affected too much by the works carried out. Work will commence on Friday 17th February, there will be intrusive work on the school grounds over half term so residents may hear a bit of drilling noise, but nothing out of the ordinary. NOTICE is hereby given that the Staffordshire County Council intend not less than seven days from the date of this Notice to make an Order the effect of which will be to prohibit any vehicle from proceeding in that length of A521 Uttoxeter Road in Blythe Bridge so much as passes over and is in the immediate vicinity of the Level Crossing for a distance of approximately 20 metres either side unless the vehicle is being used in connection with the works. The Rotary Club of Blythe Bridge and District would like to say a very big thank you to all the members of the public who supported the Christmas collection at Meir Heath and Longton Tesco. Also those who supported the street collection with Santa in his electric sleigh. On Friday 13th January 2017, Staffordshire Wildlife Trust’s headquarters, The Wolseley Centre will be holding their monthly Coffee Morning. All Welcome. Admission is £1.00 includes first hot drink free. Blythe Bridge library open day to showcase services and reveal new name. People are being invited to a celebration event to showcase the services and activities available at Blythe Bridge library on Saturday 8 October.